There was a book written about the sinking of the Titanic, 14 years before it actually sank. 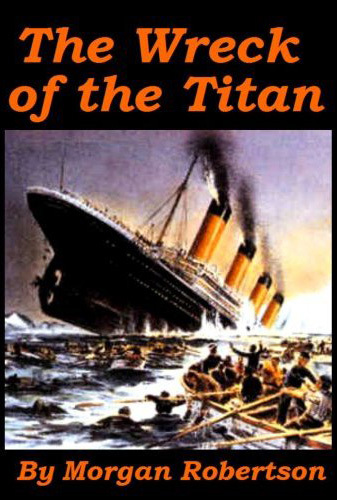 The novel written by Morgan Robertson in 1898, The Wreck of the Titan, features the ocean liner Titan, which sinks in the North Atlantic after striking an iceberg. The Titan and its sinking have been noted to be very similar to the real-life passenger ship RMS Titanic. 1. Titanic was described in the newspapers as "designed to be unsinkable", whereas the Titan was deemed "practically unsinkable" in the book. 2. There were 16 lifeboats on the Titanic, less than half the number required for her passenger and crew capacity of 3000. Whereas on the Titan there were 24 lifeboats, less than half needed for her 3000 capacity. 3. The Titanic struck an iceberg on the starboard side on the night of April 14, 1912, in the North Atlantic, 400 nautical miles (740 km; 460 mi) away from Newfoundland. The Titan also struck an iceberg on the starboard side on an April night in the North Atlantic, 400 nautical miles (740 km; 460 mi) from Newfoundland (Terranova). 4. The unsinkable Titanic sank, and more than half of her 2200 passengers and crew died. The indestructible Titan also sank, more than half of her 2500 passengers drowning. An amazing fact that is highly disturbing as well.